‘Twas City Day around here. Cousin had work, but got out early. We decided to meet at McDonald’s, of all places. Ye do not judge. It’s one of the most convenient spots to meet. No one says you have to eat whilst there. Personally, I love their ice-cream. (And cheeseburgers.) Plus it’s the only place around here where one can get soft-serve ice-cream. Wistfully looking into the distance, or ignoring me? You decide. As it was City Day, the streets were crowded. We expected it, but we didn’t expect this mad amount of people. The weather was nice (it usually rains), so I suppose everyone (and I mean everyone) took advantage of the day off. … and the crowds were gone. This is a picture heavy post (40 in all), so I’m placing the rest under the cut. I’m sure you do. You just don’t want to admit it. This is one of these little parks/ squares that the city has in abundance. 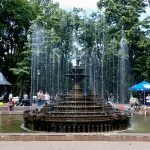 It’s one of the most charming characteristics of Kishinev. This street here is located between National Palace, central pool, and the government. I questioned my choice of background as I was editing these photos, but then I decided that I love the link between cousin’s coat and the no entry sign. We continued our walk further up, turning to Banulescu Bodoni (former Gogol) street. … All the way up to Alexei Mateevich street. This is the street where three major schools are located (all parts of the State University), and a bunch of other things, like the US Embassy (seen above to the left), the historical Water Tower, and the main entrance to the park surrounding Komsomolskoe Lake. It’s now called Valea Morilor, but still colloquially referred to as Kamsik. This street is one of the most beautiful streets when the leaves turn. I used to walk here at least every other day for many years, whilst I took my singing and speech lessons. Both the Conservatory and the Arts Institute are on this street. This is some kind of a lovers’ bridge, it seems. Another thing that’s on this street is the Registry Office. People come here to get married etc. I’m cynical, though. Keep wondering how many of these ended in a divorce already. Fyodor and Tatiana together and forever. Natural Monument. European Black Pine. Planted in 1906. Protected by the state. Not quite the Potemkin Stairs, but still pretty impressive. That’s it! After that we just chilled on a bench, waiting for J, cousin’s fiance, to swing by and whisk her away. Bigger versions of all of these are available at my Flickr. Marrakesh, Bouchee, and Cemetery Stories. ? ? ????? ?????? ????? ?????????? ?????? ????? ???????? ??????-?????!!! ???? – ??????? ???????????! ???????! ?????? ?, ???????! ????? ?????? ?, ????? ??? ? ?????? ?? ????????. Previous Previous post: A Magical Pizza Story. Next Next post: Phonecams Lately: Autumn to Winter.